In this picture, Coop’s in all his untrimmed glory. Look at those mutton chop sideburns! You can’t see it from this picture, but if his topknot were pulled back, you could see that those sideburns go up the sides of his nose and join the topknot at the V in his forehead. Except for the naked nose (and his naked tail and naked neck), you might think he was a (gasp!) poodle. This picture also doesn’t show his legs. I purposefully have not trimmed his legs since July, knowing that we’d be going into the show ring in early December. But did he come home with long, grown-out leg fur? No, he did not. Either someone has been cutting burrs and debris out of his feet and legs (not that likely), or his daily running through the fields and grasses at hunt school has torn or broken the fur off his feet and legs (more likely). Come December, Jayme is going to help groom him to get his as handsome as possible for the show ring, and whatever she can do will be a miracle. But I know Russ will miss Coop’s nature-boy sideburns. I’m just glad to get my Coop Man home. Sometime ago, I wrote a post about how upsetting it can be when a dog is sick or afraid. I hadn’t really thought about how equally upsetting it can be when the dog is fine, but the person is sick. Last week, I was very sick with swine flu. No body system was working properly or predictably, and I was feverish, coughing, achy, and exhausted. My only wishes were to lie still and to make it to the bathroom in time. In ordinary times, when Russ is home, I could have done just that. But these were not ordinary times. My dear husband was out of town taking care of his parents, and I was home sick. With a dog to take care of. Fortunately, only Tooey was home. Cooper was still up at the hunt trainer. And Tooey is relatively easy — she’s a cuddler who likes to spend long periods of time with her person. And spending it on the bed was OK with her. But dogs have to be fed. They have to be let outdoors from time to time. And their minds, if not stimulated with exercise or training, can easily lead them into mischief. Like chewing papers, or pulling threads out of the quilt, or gathering and distributing the trash. So on the worst day, I dragged myself* out of bed, put Tooey in the car, and drove to my formerly favorite boarding kennel. Maybe someone else could take care of Tooey, so I could take care of myself. But when I got there, and they discovered that she’s intact (not spayed), they warned me that if she went into heat while at the kennel, they couldn’t guarantee that an intact male dog wouldn’t get to her. She’s a puppy, who hasn’t had a heat yet. But she’s old enough to have one. I couldn’t know what would happen, so I decided not to leave her there. So we drove home again. Poor Tooey went into her crate, and I got back into bed. Except for short breaks, that’s where we stayed for the next 4 days, until Russ came home. Gives me a whole new appreciation for single parents, whose responsibility is even heavier than mine. And it also makes me very thankful for the friend who came over, bought me groceries, and let her dog come in and play with Tooey. This illness is why I haven’t posted anything for awhile. I’m still sick, but better. And Russ is home. * Yes, I know “dragged myself” is a cliche’. But I’ll tell you, that is exactly how it felt. Hunt trip finalé — dinner! Before our trip last week, I had never been hunting. But I had always thought — well, if I ever do go hunting, I will do it only if we eat whatever we kill. And unlike so many other of my pre-conceived notions, this one actually (mostly*) came true. Even though Russ didn’t shoot a pheasant, we had pheasant for dinner tonight. Rod and Renae gave us the bird Rod shot on Tuesday. It had been cleanly shot through the head, and Rio brought it back with a very gentle mouth. The night Rod shot that second pheasant, he cleaned it out on their back deck. Tooey was very interested in the whole proceedings, almost sticking her nose into the bird while Rod was working on it. Unfortunately, we didn’t take pictures that evening, but tonight, Tooey was equally interested, and we did have a camera handy. * About the “mostly.” Russ did shoot a quail on the first day, which we’re not going to eat. Instead, we plan to use it to teach Cooper to fetch and hold quail, instead of spitting it out. According to Cooper, it doesn’t taste like duck. The afternoon was too beautiful to pass up, so after lunch on Hunt Day 2, we piled back into our cars to try our luck at one more hunting spot. This was also WDFW managed lands that used to be agricultural acreage. In fact, as we hiked, we came across fallen irrigation sprinklers and capped-off irrigation pipes. Now the land is covered with sage, Russian olive trees, grasses, thistles, cattails, and small ponds. We hoped also that it would be covered in pheasants, but we didn’t see or hear any. We did see some ducks, but they were too far away. And at one point, while we were standing in a patch of tall brush, one, two, three, and maybe four quail burst into the air around us. Renae sensibly dropped to the ground. I was so stunned, I just stood there, gaping. Because the birds flew in all directions (and possibly because I was in the way), there were no good shots. So we just stopped and listened as the birds flew away. The day was late and hunting stops 30 minutes before sundown (4:30 p.m.). So the four people hiked back enjoying the sunset scenery, a tired Cooper tried to keep Russ and me in line, and Rio kept on trying to hunt up birds. The morning of Day 2 found us on wildlife habitat land near Warden, Washington, managed by the Washington Department of Fish and Wildlife (WDFW). Since it used to be agricultural land, the walking was mostly flat, criss-crossed with drainage ditches and rows of wild roses. The four humans and two dogs were circling back toward the cars, when Russ and Renae heard a pheasant rooster cackle in one of the rose hedges. Rod and Rio went up one side of the hedge, and Russ and Cooper went around to the other side. Rio flushed the bird into the air, where Rod had a perfect shot, dropping the bird into the grass. At the sound of the gun, Rio and Cooper raced off in the direction of the fallen bird. (Honoring another dog’s retrieve isn’t in Cooper’s mental vocabulary yet.) Fortunately, Rio found the bird first, made the retrieve, and proudly returned the bird to Rod. After a day of hunting, there is always dog clean up to do. In one of our pre-trip emails, Renae had predicted about 1/2 hour of brushing out the dogs. For Cooper, it was more like 1-1/2 hours. The dogs had gotten wet from their bellies down, curling the fur tighter around all the plant debris. Rio’s fur was clipped short — just right for hunting. Plus, Rio has an interesting habit — he bites burrs out of his coat as soon as he gets them, so that saves some work at the end of the day, too. Brushing him out took Renae the predicted 1/2 hour. But Cooper’s coat was much longer than Renae had realized — giving the burrs, seeds, sticks, brambles, stickers, and leaves even more places to hide. Cooper was mostly patient about all that brushing — I think he was too tired to protest too vigorously. 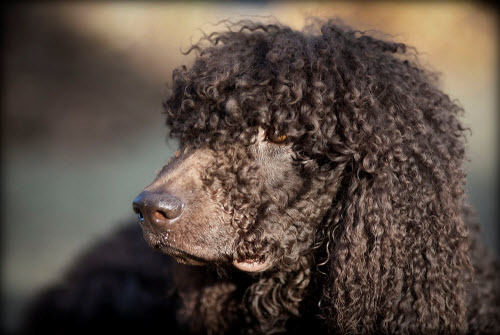 If you’ve been reading this blog for awhile, you already know what I think about the idiocy of keeping an Irish Water Spaniel’s fur long for show. But there it is — people show their IWS with longer fur than they would ever dare for hunting. If they’re thinking straight, that is. Our excuse is that we’re planning to show Cooper in December or January, so we couldn’t (didn’t, wouldn’t) simply clip his fur. We probably should have, though. Rod and Rio, with the advice and consent of Renae, make a great team. Rio hunts ’em up and Rod brings ’em in. That’s why, this particular afternoon, Rod got the first pheasant. The rules state that hunters can only shoot roosters, and the one Rio flushed from the bushes was a beauty. Rio flushed the pheasant up and out of the cattails, and Rod got a nice center shot. But in an explosion of feathers, the bird went straight back down, further into the dense patch of cattails. Rod sent Rio back into the cattails to start searching, encouraging him with “Where’s the bird?” and “Find the bird!” Using his nose, Rio located the bird deep in the cattail patch, and brought it out to Rod. This is where an Irish Water Spaniel’s thick curly coat has an advantage, protecting most of the dog from the cattail’s sharp edges. After a day’s work, Rio had a few red areas around his nose and tail (plus about 10,000 miscellaneous seeds and plant parts). We were out for about 5 hours at the Lower Goose, and loved every minute of it. The dogs flushed up two birds, and the hunters got them both.